Been busy – Hello Korea ! It’s a collection of some questions that have been asked by various people and that we are collectively answering. 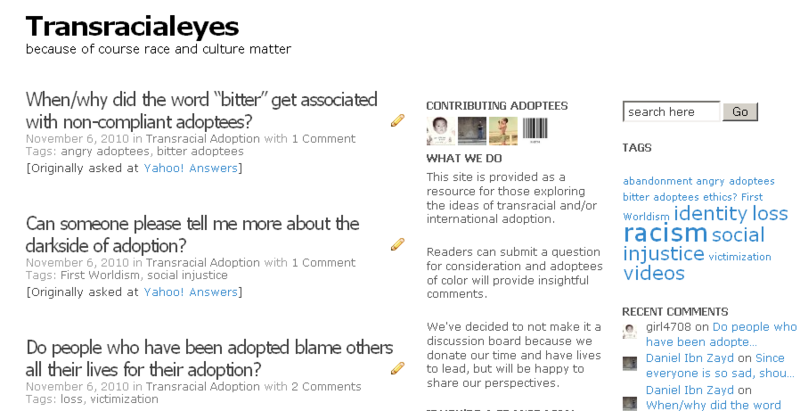 If you know of anyone who would like to submit questions to transracial adoptees, there’s a link at the site. Also, if you are an expressive transracial adoptee writer, please contact me there. We hope to be a diverse place and represent both domestic and international adoptees of all races. Re-edited the A Collection of One video. This time it has a more fitting song, recommended by my friend Miwha, and is meant for Korean audiences. Better edited, it is also a minute longer and individually features all 76 of the adoptees who sent us their referral photos. what is my own reflection off the shop window looking for? I miss you my love, you are so beautiful ! My understanding is that this isn’t about han like the last song, but about deeply irretrievable personal loss. This weekend saw two live acoustic sets until 10 pm (one was really good! – kinda like that 10cm group) and then danced to some awful mixes until about 4 a.m. until a friend got hustled for money by wanna-be gigolos. En route to being hustled, I danced with a Cuban in the streets of Seoul. Around 4:30 am ran into the Cubano again with all his gyopo friends, and, upon finding out I was an adoptee, one really nice gyopo’s first words were: “Oh man. I really respect you. ” Did the planets shift alignment or something? Is the world possibly getting better / catching a clue? He gave me his digits. Will definitely follow up. Gyopos are the best. Too hurting to make it to Gayageum, slept until 1pm and then met the TRACK crew for their annual board dinner. Since there’s only two more lessons until performance, I’m wondering if I’ve handicapped myself too much to continue…Anyway, after the dinner went out dancing salsa with our main benefactor flown in from Provence, Greg. Met his wife and daughter the previous Wednesday, and they were awesome. Was a treat to see a well-behaved kid for a change. More dining out with Greg & Jane and then back to Cheongpyeong by nightfall. Greg couldn’t decide if he liked Makkolli or not, but I think it grew on him by the end of the evening. Greg left after visiting my school in the morning and sitting through morning broadcast, after which I walked him to the bus stop for a day of hiking. Tonight I gotta mock up a planner, do some copy editing, and create a few days worth of morning broadcasts. For some reason I feel like I’ve been gone two weeks this weekend, and I saw my students today and was so happy to see them. It was so amazing to have human contact this weekend. I fear crashing hard over the next week. Because you know, the work helps but it’s just no substitute for people. And I’ve got a lifetime of people void to fill. i love the new blog. and the re-edited video. well done.